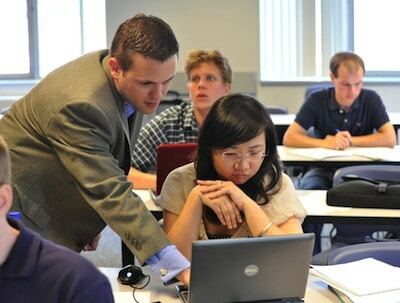 Dr. Matt Drake with a student. A recently published book by Duquesne University business professor Dr. Matt Drake has been named to three different lists of essential new works on supply chain management (SCM). The Bridgefield Group, a Georgia-based organization providing supply chain consulting and education services for various industries, which calls the book recommended reading. No other work on any of the lists was named on all three lists. The book is being used in classes at Bowling Green University and the University of Maryland. Written for SCM-outsiders as well as specialists, the book has just four chapters. After introducing the subject, he delves more deeply into sourcing and transportation—the two SCM functions that often present significant challenges, particularly in a global business environment. Global Supply Chain Management also addresses sustainability, product tampering, fraud and deception, sweatshop labor and other ethical issues popping up in cross-border business deals. Global Supply Chain Management is available from the publisher’s website and from Barnes & Noble and other book vendors. Individual chapter reprints are available through the website of the Harvard Business Publishing. For more information, visit www.duq.edu.